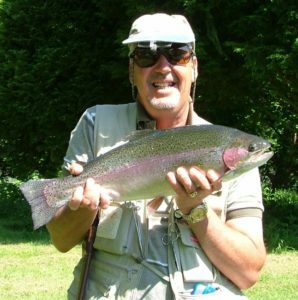 I started Fly Fishing in the mid-seventies on the Wiltshire Avon. I was very lucky, as a member of HM Forces, to be able to fish the stretch owned by the Services Dry Fly Fishing Association (SDFFA). This stretch, managed by the famous Frank Sawyer, one of the best fly fisherman of all time, and inventor of the famous Pheasant Tail Nymph. 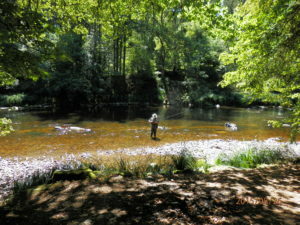 That remarkable, crystal clear chalk stream, brought to life by Frank Sawyer, taught me that fly fishing has all of the elements associated with hunting game. Far from being a sedentary sport, just sitting and waiting on the river bank, you are mobile, stealthily hunting your fish. And this, in some of the most beautiful scenery that it is possible to imagine. I have been very lucky to have fished in some amazing places. The reason that I started this Blog, was to share my experiences, as an ‘average fly fisherman’ with others. Particularly those just getting started in this, the most rewarding of all types of fishing. I don’t say that lightly, I have experience of Course Fishing, Sea Fishing, including Sea Fly Fishing. For many years, I was an IGFA Certified Fishing Captain and I am a current IGFA World Record Holder. The record is for a rather poisonous fish caught off of the island of La Gomera, unfortunately, not on a fly. My mentor, when I started Fly Fishing, was a Gentleman called Michael Kitchen. He was, from my perspective, indeed an expert Fly Fisherman. Not only did he cast superbly, but he also used the flies that he tied himself to c ontinually catch fish, irrespective of the conditions or location. I learned an awful lot from Mike, who taught me the art of Upstream Dry Fly and Nymph Fishing. When ‘nymphing’ we, of course, used Frank Sawyers Pheasant Tail Nymph or PTN. We had tied these ourselves in the original form without using thread. After many blank weeks on the Avon, I quickly learned the art of ‘stalking’ the fish. I subsequently caught my fair share of brown trout and grayling. My first Fly Fishing rod was of course made of the tried and tested GRP or glass reinforced plastic. It was cheap but quite suitable for a novice like me, finding difficulty keeping the fly line in the air. Mike, of course, had one of th e ultra expensive and newfangled carbon fibre rods. These came with a warning not to take them anywhere near electricity pylons. Carbon fibre rods were quite prone to breaking, combined with the initial purchase cost, were out of my reach. To upgrade my fishing rod at a reasonable cost, I built my own split cane rod from a kit. I spent an entire winter building the rod, customizing it with my name and varnishing it to perfection. The end result, even if I say so myself, was pretty good. It was a pity I had chosen the wrong tip action but didn’t understand that it was important. I was extremely proud of that rod and persevered with it for many years. I can recall a hot summers day on a Hampshire fishery, where Mike was teaching me to fish with sub-surface buzzers. He had already caught more than a dozen fish while I had only caught the sun. Mike then decided to concentrate my mind and sat beside me. He instructed me to concentrate on the water above the buzzers and on the line, which I was holding too loose. ‘Did you see that?’ he asked I, of course, had seen nothing. Eventually, after missing many fish, I started to see the subtle movements on the water and the almost imperceptible twitch on the line. I was as pleased with the one fish that I did catch as Mike was with his bag full. Over the years I have been lucky to have fished in England, Wales and Scotland, but also the Catskills in the USA, British Columbia in Canada, the Pyrenees in Spain, Austria and Germany. This year, I will fly fishing in Bavaria, Austria and the Czech Republic. I consider myself a b it of a purist. 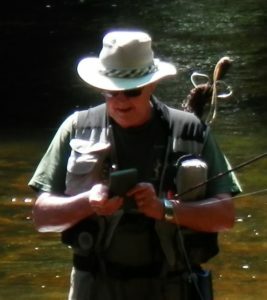 I prefer Dry Fly & Nymph, seldom resorting to a wet fly or streamer, but even so, it is insufficient to just fish upstream. You don’t catch much fish using the upstream method when fishing a fast flowing river such as the Ilz in Bavaria or the Ybbs in Austria. When fishing rivers, I always return the fish to the water unharmed, much to my wife’s chagrin. Therefore, to keep the peace, and to provide fish for the table, I make regular visits to ‘put and take’ lakes where they breed fish for the purpose. Although I am not a great lover of eating fish, who could resist fresh trout fillets, cooked in butter and sprinkled with almonds? Even better, hot smoked trout, direct from my smoker, served with brown bread and butter! I will be writing regular Blogs about my past experiences whilst waiting patiently for the season to commence when I can Blog about current fishing trips. I will also be reviewing some equipment and providing a few Top Tips. It’s 1966, the height of the Cold War, when a Soviet Yak Jet Fighter over-flying the British Sector of Berlin, crashes into the Stossensee Lake, not far from the British Headquarters. The Allies need the secret technology on the aircraft and mount a covert operation to retrieve it and the Russians make an armed incursion into West Berlin in an attempt to stop them. The Russians need to secure their advanced technology themselves and send a top KGB agent into West Berlin and activate a sleeper agent at the British Headquarters. When they find the secret technology on the aircraft to be missing, Wolf, an experienced SIB Investigator arrives and the case quickly turns deadly. Wolf flushes out an East German Stasi cell and as the body count mounts, Wolf must find out why. A Task Force including Military Intelligence and US CID is set up to recover the aircraft component, but can’t stop the bloody rampage of the covert Stasi Cell. 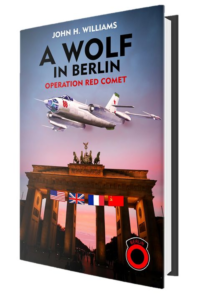 This is John’s second novel in the ‘Wolf in Berlin’ series and is set in Berlin in 1945 and 1966/67. In 1945 at Himmler’s Mystic Wewelsburg Castle, a secretive SS Order meets to induct a new candidate and to prepare plans to deceive the Allies into believing that Hitler died in his Fuhrer Bunker, and prepare for a New World Order after the war. Twenty-two years later, SIB Investigator, ‘Wolf’’ starts to unravel a plot by Neo-Nazis to implement Himmler’s plans.